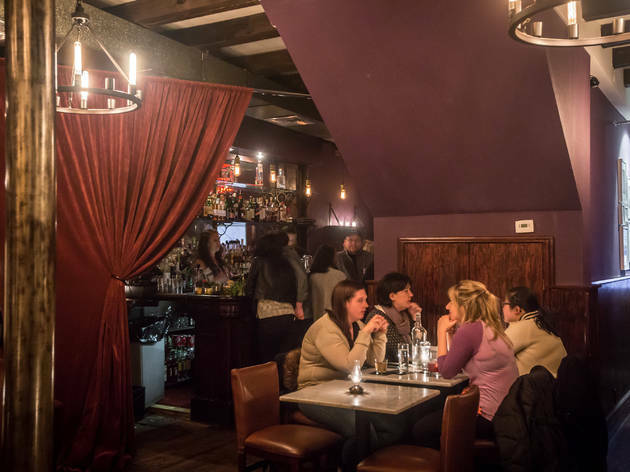 You’ll miss the entrance of this uptown lounge at least once, if not twice. Recheck the address all you want—this is the place. Inside a small leather-and-accessories shop with a pair of gold-leaf scissors emblazoned on the window, the shopkeeper-host leads you through velvet curtains and into a warm drinkery overseen by the Gilroy trio Steve Laycock, Josh Mazza and Francis Verrall, with former Dead Rabbit bar maven Pamela Wiznitzer behind the stick. 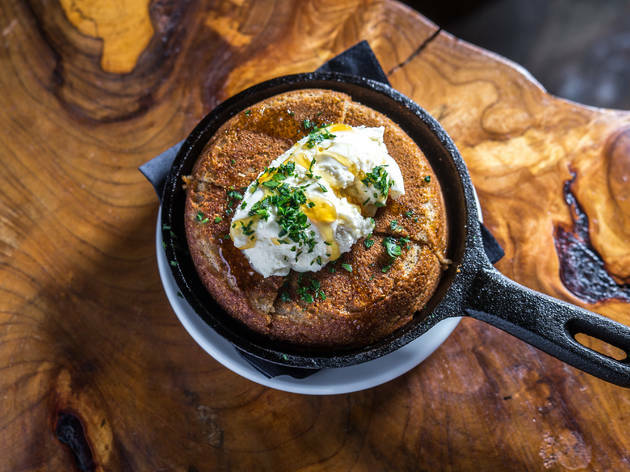 With two bars turning out stellar cocktails and Ducks Eatery chef Will Horowitz whipping up food to match, this neighborhood haunt is a destination to look out for—literally. 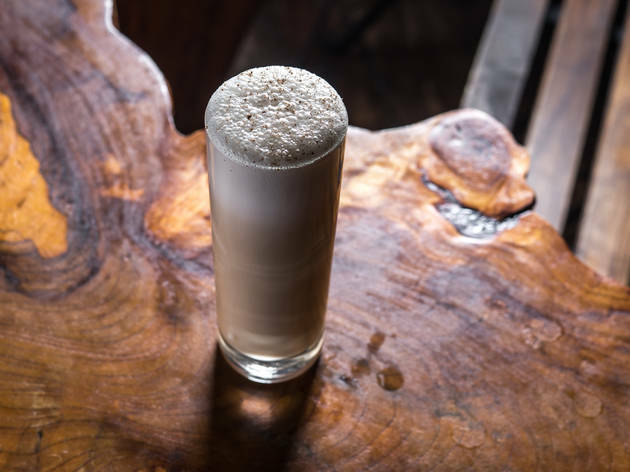 ORDER THIS: Wiznitzer collaborated with cocktail historian David Wondrich on 50 of the drinks, but the frothy egg-white-topped Wiz Fizz ($13) is all her own, lacing root beer and cream with gin, sherry and herbaceous Cynar liqueur for a punched-up soda-fountain float. A lighter shakeup is the tequila-thyme Tabletop ($12), which gets zing from a Cajun-spiced pink-salt rim and some brightening bubbles via celery soda. 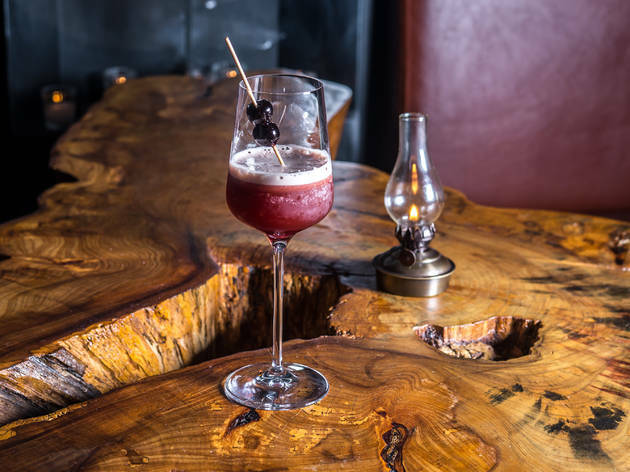 The team also concocted a dessertworthy, cocoa-tinged cold-brew, Early Bird ($13), which blends oaky, vanilla-licked Remy Martin cognac with sweet cherry preserve. GOOD FOR: A drinks-filled dinner date. Seating looks more dining room than cocktail lounge, with four-top leather booths along the walls and a long wooden table at the center, but Horowitz’s extensive food menu justifies it, offering raw-bar items, crispy griddle cakes still in their sizzling cast-iron pan and slathered in tangy farmer’s cheese ($7), and garlicky fried cauliflower with house-made sage pesto ($10). 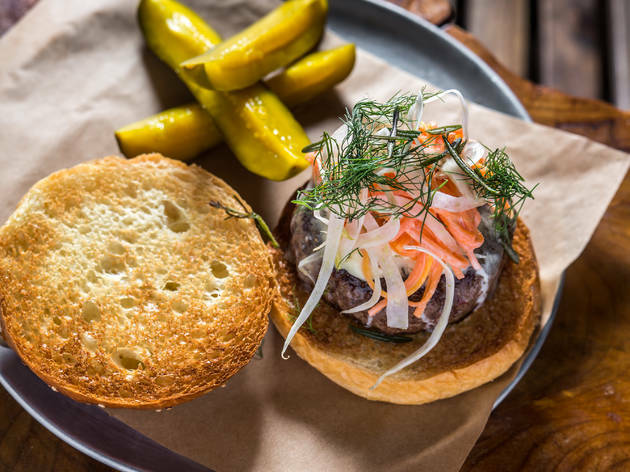 But it’s the tender, gamey mutton burger ($18), showered in pickled carrots, shaved fennel fronds and fried rosemary needles, that shows off Horowitz’s kitchen clout. THE CLINCHER: In lieu of typical bottle service, Wiznitzer has gone elaborate, dreaming up brainy mixtures like hibiscus-lemon-grapefruit and Earl Grey–Cointreau bitters to pair with a series of 375ml bottles of booze, ranging from Beefeater gin ($59) and Piper-Heidsieck champagne ($59) to Glenfiddich ($99) and Appleton rum ($59), that serve between two and six people. 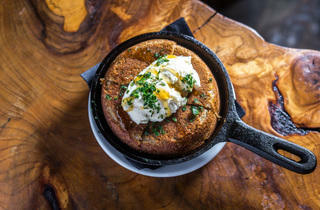 The service, cutely named Tailor-made, feels highbrow without breaking the budget. 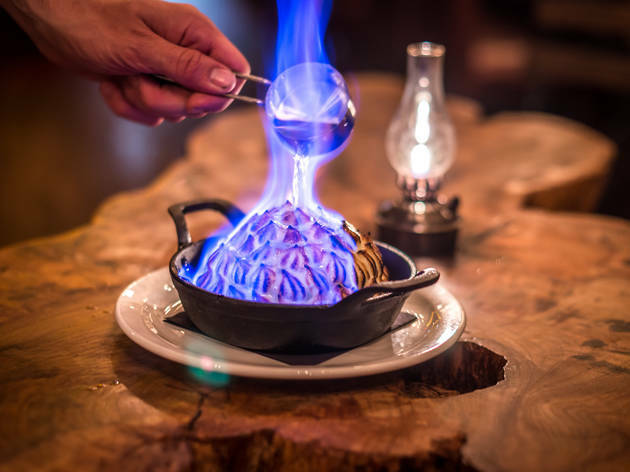 Presented with a bowl of ice, glasses, stirrers and an array of garnishes, the feature allows you to take control and impress your company. 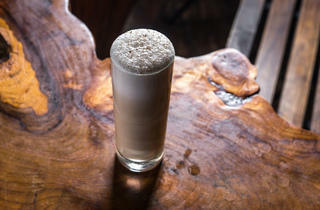 Shake your drinks, short or tall, as lightly or vigorously as you like—at Seamstress, one size doesn’t need to fit all. 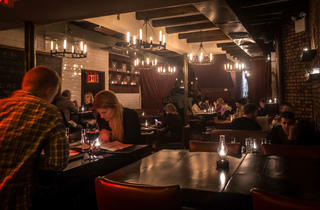 Great "speakeasy" style bar in the Upper East Side, definitely a hidden gem up here. Expect to drop a lot of money; there are tons of cocktails and it's nice to try a variety, but it'll come at a cost. 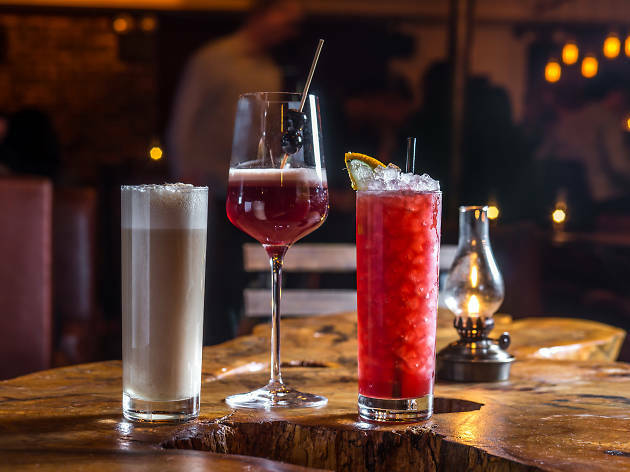 They have anything and everything from boozy-style root beer floats to classic drinks like gin & tonics, anyone can find a drink here that fits your taste. 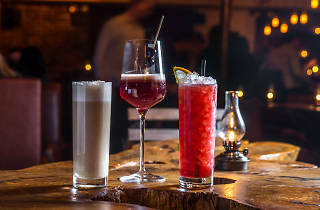 Finally a legit cocktail bar on the UES. The drinks are terrific and there are a wide variety to choose from. 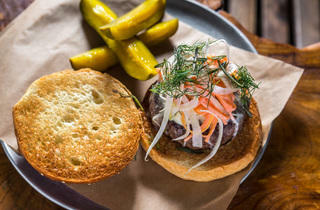 The food is all high end comfort-y bar food that suits the space and the vibe. I love to meet friends here because we can enjoy the low light, late night crowd while still being able to catch up and hear one another. Intimate and Cozy. Staff is attentive. Bartenders awesome. Cocktail List is fun. Cool speakeasy style cocktail bar tucked away on 75th St. The cocktail list here is HUGE and whatever you order, it will be excellently crafted by the talented bar staff. The food here was pretty decent too, although my main takeaway was the Fried Cauliflower served with sheep's cheese. It's like a healthier (well, sort of) version of mac n cheese! 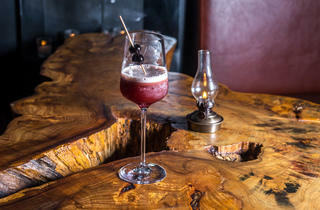 The drinks are pretty pricey, but it's a great place for a date. 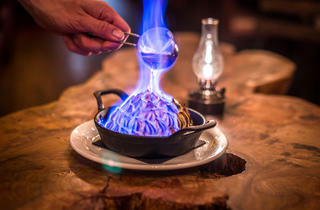 Fun little spot in the UES, with a cozy vibe, inventive and quality cocktails, and plenty of bites to choose from too--the oysters Rockfeller are served with a little eyedropper of absinthe your server will drip-drop over the top. 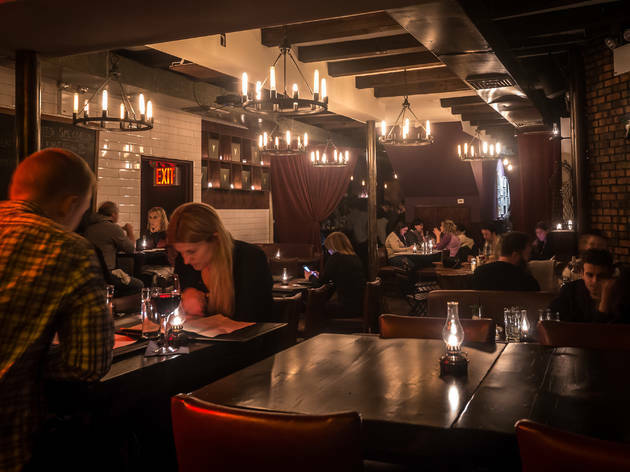 The Upper East Side is definitely the place to be when it comes to new nightlife and restaurants, and The Seamstress is solid proof of this. Right off the corner of 75th Street, you would probably walk right past if you didn't look closely and then you would miss an awesome roster of cocktails and a great dinner soak up the booze. 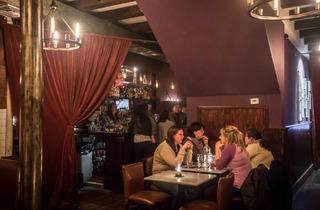 The restaurant/bar/shop hybrid is dimly lit and perfect for a date or to grab a few drinks with friends. The oysters come with a smoked Mignonette sauce and the fried chicken is exactly what you need to down a few more aptly named cocktails (I'm a fan Mortimer & Mauve). I would even say it's worth going out of the way to try it.